The Hellgate CSA also distributes products from other suppliers during our regular distributions. For these products, you'll make your purchase directly from the supplier and then pick up your order along with your regular shares. 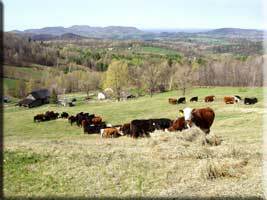 A perrenial CSA favorite, the Lewis Waite farm produces grassfed cattle, lamb, and pork for a number of NYC CSAs. Farmers Alan and Nancy Brown coordinate with nearby farms to also offer poultry, cheese, milk and other delicious foods. Offerings include pasture-raised meat and poultry (10 kinds of meat), fresh eggs and bread, grass fed butter, yogurt and ice cream, artisan cheese from sheep, goat or cows’ milk, including aged raw milk cheeses. Other choices include pantry staples, too, all local and naturally made: granola, fresh stone-ground organic flour, dried organic beans and grains, natural jams and chutneys, natural sweeteners, locally roasted organic coffee, apple cider vinegar, and more. To purchase products from Lewis Waite farm and their neighboring farms, just go to their web site and use their order form. Then you pick up your order on Tuesdays with your regular CSA share. Please pay via the Lewis Waite web site or mail a check directly to them. Hellgate CSA does not accept checks at distribution. Even if you haven't been able to join the CSA for the season to receive vegetable and fruit shares, you can place orders for meat, poultry, eggs, bread, cheese, and all sorts of other products from Lewis Waite Farm and their partners in upstate New York. The deliveries during the Summer and Fall happen on average, twice per month. Deliveries during the winter are once per month and take place at a members home. These dates are subject to change please check your LW account to be up to date. Ordering and payment happen individually -- you'll put in an order with the farm directly, pay them, and they'll deliver your order to us, frozen and packed in insulated boxes. You can pick them up at the usual time and place, 5:30 to 7:45 pm on Tuesday afternoons. Make sure that when you order, you are available to pick up your order on the Tuesday scheduled for distribution. All orders should be placed through Lewis Waite. The first time you place an order you will need to create an account. Fill out this form. Once you are logged in, you can page through the product lists and start making a list! Orders must be place by the order cutoff date for distribution on the delivery date. Upon placing an order, you will receive an email order acknowledgment displaying all the items ordered with estimated amount based on the average size/weight of items. If you do not get an order acknowledgement, your order was not properly placed and you should try again (or contact LW for help). If you are paying by PayPal you will not be invoiced until the order is packed. Invoices are sent out based on size/weight of items and availability (occasionally ordered items are unavailable at the time of packing in which case you will not be charged for unavailable items) usually the night before or the day of distribution. If you are paying by check, please mail your check directly to the farm (address provided on LWF website) made out in the amount owed to "CSA LEWIS WAITE FARM". Please mail your payment promptly to the LWF as the farms really count on timely payment. Deadline for orders is, usually, midnight the Tuesday before delivery for raw milk cheeses and Thursday for everything else. Please respect the deadline as the farms need time to prepare orders and send them in time for delivery the following Tuesday.